The following is the full text of the speech delivered by President Mary McAleese at a State Dinner this evening in Dublin Castle, in honour of the visit of Queen Elizabeth. A full MP3 of the speech is available here. A Shoilse Banríon, A Mhórgacht Ríoga, A Thaoisigh, a Phríomh-Aire, a Chéad Aire, Tánaiste, Rúnaí Gnóthaí Eachtracha agus a aíonna oirirce, fearaim céad míle fáilte romhaibh tráthnóna go Caisleán Bhaile Átha Cliath ar ócáid atá thar a bheith speisialta ar fad. It is my pleasure to welcome you to Dublin Castle this evening on this the first ever State Visit to take place between our two countries. This visit is a culmination of the success of the Peace Process. It is an acknowledgment that while we cannot change the past, we have chosen to change the future. The relationship between our two neighbouring nations is long, complex and has often been turbulent. Like the tides that surround each of us, we have shaped and altered each other. This evening we celebrate a new chapter in our relationship that may still be a work in progress, but happily, has also become a work of progress, of partnership and friendship. The contemporary British-Irish relationship is multifaceted and strongly underpinned by the most important connection of all – people and families. Large numbers of British born people live here in Ireland and many more of our citizens have British backgrounds, ancestry and identity. In Britain, those of Irish birth, descent or identity are numbered in millions. The two way flow of people between these islands goes back millennia. This very room is dedicated to St Patrick, whose name is synonymous with Ireland. Yet he is reputed to have been born in Britain. Patrick’s life as the man who brought Christianity to Ireland is illustrative of the considerable exchange of ideas and knowledge that there has been between our two nations throughout history. “England had conquered Ireland, so there was nothing for it but to come over and conquer England”. However, even Shaw might not have dared to imagine that this cultural conquest would come in time to include rugby and cricket. The Irish in Britain and the British in Ireland both as individuals and communities, have made an invaluable contribution to both our homelands while also cementing the links between us. Today those links provide the foundation for a thriving economic relationship. As close trade and investment partners and as partners in the European Union, Britain and Ireland are essential to each other’s economic wellbeing. It is imperative that we work fluently together to promote the conditions that stimulate prosperity and opportunity for all of our people. It is only right that on this historic visit we should reflect on the difficult centuries which have brought us to this point. Inevitably where there are the colonisers and the colonised, the past is a repository of sources of bitter division. The harsh facts cannot be altered nor loss nor grief erased but with time and generosity, interpretations and perspectives can soften and open up space for new accommodations. Yesterday, Your Majesty, you visited our Garden of Remembrance and laid a wreath there in honour of the sacrifice and achievement of those who fought against Britain for Irish independence. Today at Islandbridge, just as we did at the Island of Ireland Peace Park at Messines in 1998, we commemorated together the thousands of Irishmen who gave their lives in British uniform in the Great War. As the first citizen of Ireland, like my fellow countrymen and women, I am deeply proud of Ireland’s difficult journey to national sovereignty. I am proud of how we have used our independence to build a republic which asserts the religious and civil liberty, equal rights and equal opportunities not just of all its citizens but of all human beings. I am particularly proud of this island’s peace-makers who having experienced first-hand the appalling toxic harvest of failing to resolve old hatreds and political differences, rejected the perennial culture of conflict and compromised enough to let a new future in. The Good Friday Agreement represented a fresh start and committed us all to partnership, equality and mutual respect as the basis of future relationships. Under the Agreement, unionism and nationalism were accorded equal recognition as political aspirations and philosophies. Northern Ireland’s present status within the United Kingdom was solemnly recognised, as was the option for a united Ireland if that secures the agreement and consent of a majority of the people of Northern Ireland. The collegial and cooperative relationship between the British and Irish Governments was crucial to the success of the Peace Process and we can thank the deepening engagement between us as equal partners in the European Union for the growth of friendship and trust. The journey to peace has been cruelly slow and arduous but it has taken us to a place where hope thrives and the past no longer threatens to overwhelm our present and our future. The legacy of the Good Friday Agreement is already profound and encouraging. We all of us have a duty to protect, nurture and develop it. Your Majesty, from our previous conversations I know of your deep support for the peace process and your longing to see relationships between our two countries sustained on a template of good neighbourliness. Your visit here is an important sign – among a growing number of signs – that we have embarked on the fresh start envisaged in the Good Friday Agreement. Your visit is a formal recognition of what has, for many years, been a reality – that Ireland and Britain are neighbours, equals, colleagues and friends. Though the seas between us have often been stormy, we have chosen to build a solid and enduring bridge of friendship between us and to cross it to a new, a happier future. Your Majesty, your Royal Highness it is in that spirit of mutual respect and warm friendship, it is in faith in that future, that I offer you the traditional warm Irish welcome – céad míle fáilte – one hundred thousand welcomes. And to continued friendship and kinship between the peoples of Ireland and Britain. Email “In full: the speech of President McAleese at the State Dinner”. 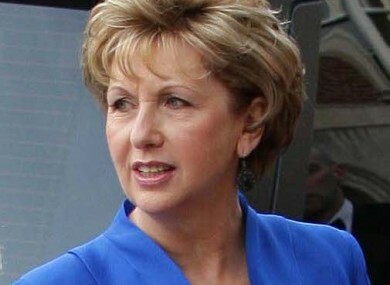 Feedback on “In full: the speech of President McAleese at the State Dinner”.